Occupy Wall Street Protests: Where is NPR? : NPR Public Editor There has been more coverage than many protest supporters realize. 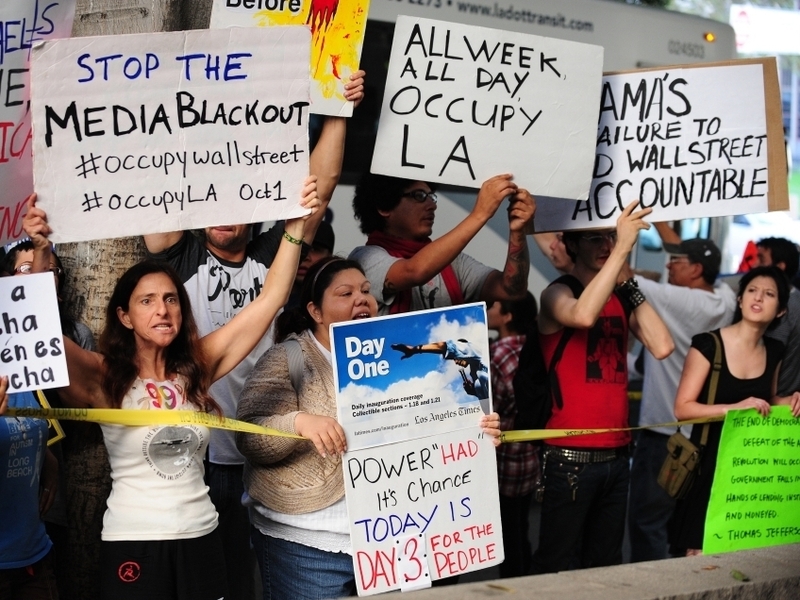 Protesters shout slogans while holding banners Monday at Occupy Wall Street protests in Los Angeles. Cover it more — now! That has been the gist of a stream of messages that continue to pour in from supporters of the ongoing Occupy Wall Street protests in New York City, Los Angeles and around the country. Doug Peterson of Omaha, NE, went so far as to say: "I hear that NPR has decided NOT to cover the demonstrations involving Wall Street. Is this because NPR gets most of its donation support from Wall Street? If so, then I'll just stop donating as I have done for the past 35 years." The protests are a lead story tonight (10/03) on All Things Considered and have gotten more play than many critics seem to realize. I agree with editors that the lack of a clear purpose for the protests make it a hard story to give importance to. But the persistence of the protesters cannot be denied. Below is the breakdown of on-air and online coverage, which doesn't include wire stories online and hard news items on the hourly newscasts. The coverage seems about appropriate to me. NPR has also posted stories on www.npr.org from the Associated Press. Search "occupy Wall Street. NPR doesn't make transcripts of its hourly newscast reports, but has run many items on the protests, including more than a dozen of them this past weekend alone, according to Executive Producer Robert Garcia.